Unexpectedly, today has been my lucky day on the Wikipedia front page. 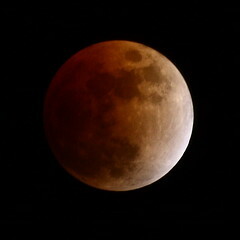 Two nights ago I tried my hand at photographing the lunar eclipse. With plenty of experimenting, I got one image of totality I was pretty happy with (above): a one-second exposure, with my camera propped up against the back of a laptop to maintain the right angle. Longer exposures (and many of the one-second exposures I tried) had too much motion blur; shorter exposures or with higher ISO were too dark/noisy. I put it up on the February 2008 lunar eclipse page, as one of many observations from different times and places. A little while later, I got a message informing me that the image was being used for “In the news” to illustrate the eclipse on the Main Page. It’s also now the lead image for the eclipse article. Then at midnight UTC, February 22, “Today’s featured article” clicked over to Rachel Carson, my last major Wikipedia project. See how it changed during it’s 24 hours in the spotlight. I’m going to reverse the two most significant changes, the softening of the bit in the lead about the environmental movement and the deleted sentence about the Reagan administration’s attacks on the environmental legacy of the of the 1960s, both of which are well-supported by the sources used for the article. But since it’s apparently a point of contention, I’ll add more backing for the Reagan bit, from something about Reagan rather than Carson. The Carson article apparently inspired an ASCI portrait of her. Found this from your paper on wikis, which I enjoyed, by the way. I’ve heard very very people discuss the need for more interaction between academia and the real world. Good to see you’ve infiltrated the ivory tower with some good ideas in mind ;-).